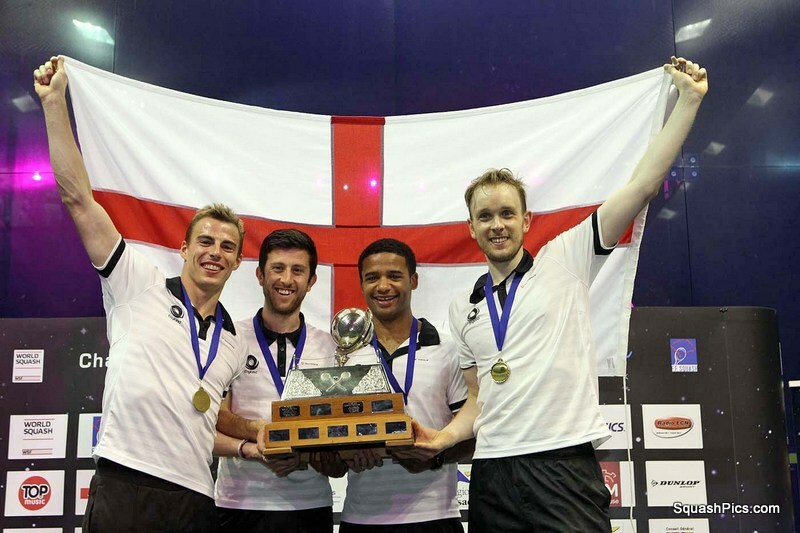 In a dramatic final of the WSF Men’s World Team Squash Championship in France which went the full distance, second seeds England upset defending champions Egypt to reclaim the sport’s most prestigious trophy for the fifth time since 1995. 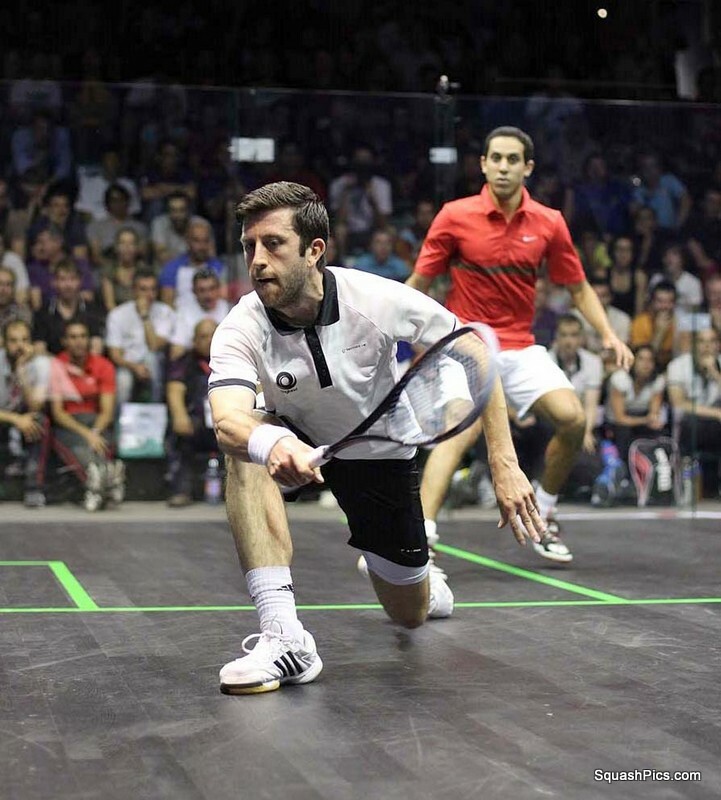 Daryl Selby put the underdogs ahead before world number one Ramy Ashour evened matters for Egypt, the top seeds bidding to become the first nation since 1987 to win the title three times in a row. In the decider, world No4 James Willstrop made up for his loss to Karim Darwish at the same stage of the previous final two years ago to beat the world No5 11-3, 11-13, 11-3, 11-5 to clinch the title for England for the first time since 2007. 31 nations have been competing in the 24th edition of the championship which is being staged in France for the first time in its 46-year history. 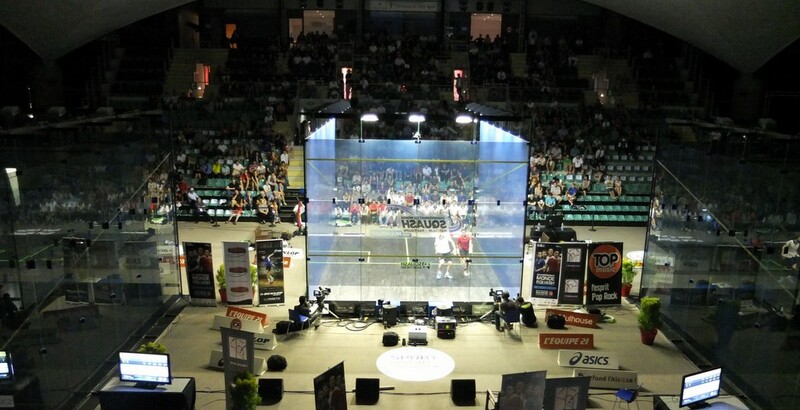 Play has been taking place at two venues in Mulhouse, the Espace Squash 3000 Centre and the Palais Des Sports where, for the first time, matches have been played simultaneously on three ASB all-glass showcourts spectacularly lined up side-by-side. England made a great start when team number three Selby beat Tarek Momen 11-5, 11-3, 11-7 in his first win over the higher-ranked Egyptian for over three years. “I am much fitter now than I was,” said Selby when asked to explain the end of his losing run to Momen. “The focus of my training for the last six months has been for this match,” continued the world No14. “The England team has taken this event extremely seriously. Watching James and Nick last night was an inspiration – the amount of effort they put in was phenomenal. I just wanted to put in the same – and if that helps us win the title I’ll be happy. “The whole England Squash team put in a lot of effort and energy into the elite programme – and that win was the repayment of that investment. It’s also repaying the support from my family and, of course, there’s new member of my family since last time. In years to come, I would like him (baby son Noah) to be able to say that Daddy was a world champion for England. “I couldn’t have dreamed of a better performance – my good friend Peter (Barker) would have been watching – as I watched him last time do the same thing to Hisham Ashour. 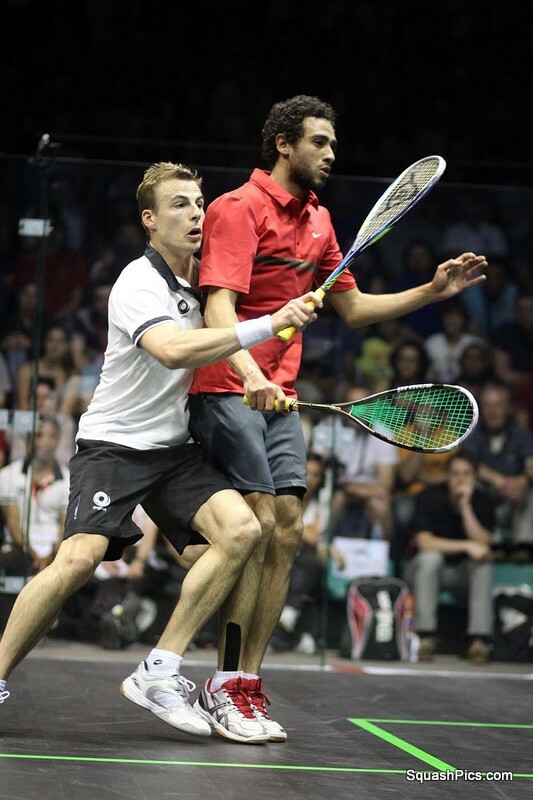 Nick Matthew, who prevailed in the event’s longest match when he beat the hosts’ world No2 Gregory Gaultier in a 138-minute semi-final marathon less than 24 hours earlier, was unable to stop world No1 Ramy Ashour from levelling the tie. 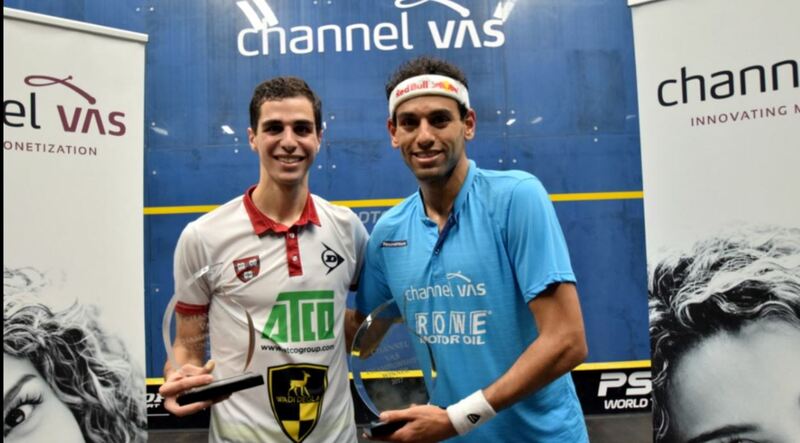 Ashour extended his unbeaten run in the event over the last six years when he beat Matthew 5-11, 11-6, 11-9, 11-9. 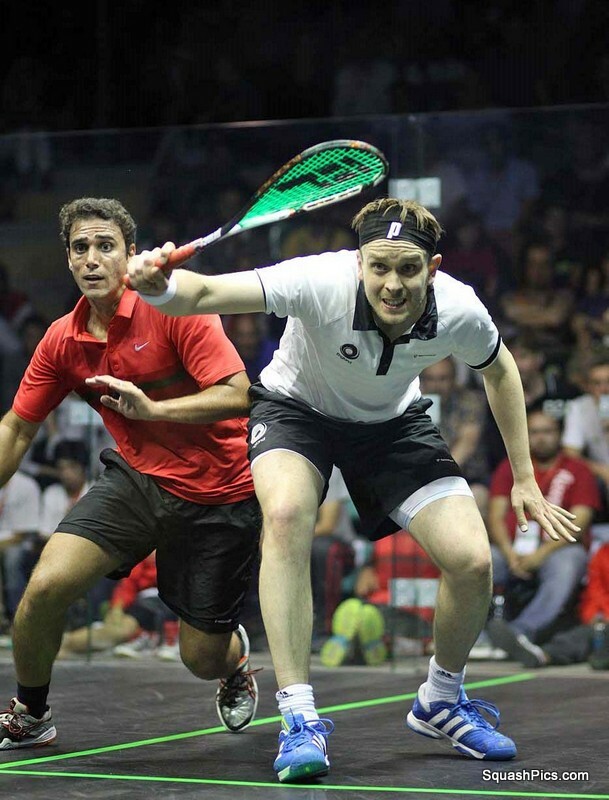 But Willstrop was the underdogs’ hero, taking out Darwish in 69 minutes of tense squash to bring the world title back into England hands. “It doesn’t get much bigger – does it?” said the 29-year-old Yorkshireman as he tried to take in the achievement. 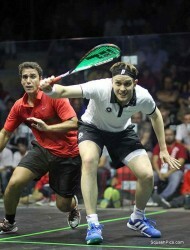 “We’ve worked so hard for this – we’ve had unbelievable support from England Squash back home,” Willstrop continued. “Nick made an amazing contribution last night. “We had so many disappointments along the way after last year – so it’s nice to get the trophy back. England national coach Chris Robertson was delighted with his team’s success: “It’s good to win something you deserve to win – and I think we deserved to win this title tonight. 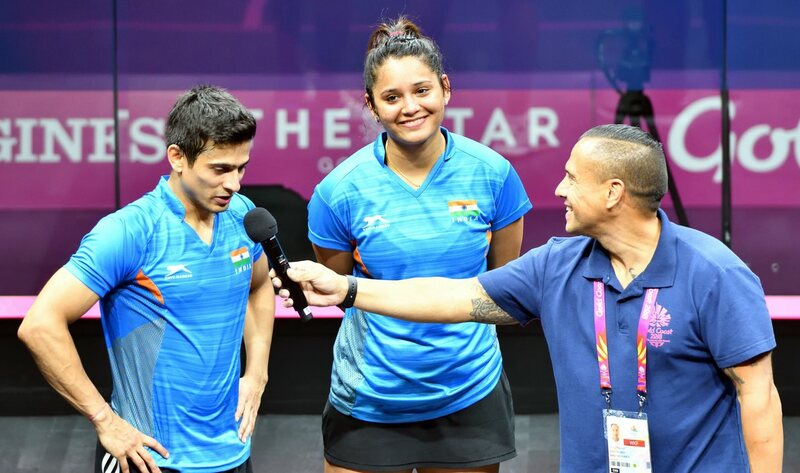 “Our goal is to win things – it was very disappointing to lose the final two years ago in Paderborn and also the women’s world final in Nimes last year. “And it was good to see James exorcise his demons of Paderborn. “I hope this will inspire some of the younger players back home – we need them to realise that they can also wins things. Earlier, to the ecstatic delight of the packed crowd at the Palais des Sports, hosts France won the bronze medal play-off battle against Australia – the third seeds beating the fourth-seeded former champions 2/0. Squad number three Mathieu Castagnet survived a tense and close encounter against Ryan Cuskelly, twice coming from behind to beat the Aussie left-hander 8-11, 11-8, 7-11, 11-9, 11-6. Showing few signs of the marathon encounter less than 24 hours earlier against England number one Matthew – after which he was barely able to walk – Gregory Gaultierput in a composed performance to overcome world No13 Cameron Pilley 11-9, 11-4, 11-4. Team coach Renan Lavigne admitted that a team effort, involving the team physio, his staff and all the players helped lift Gaultier after his energy-sapping semi. “He said to me this morning ‘I want to play’,” said Lavigne. “Right now I’m just relieved. It’s been a long week – and a long night last night, which was hard work. “We were aiming for a podium finish so any medal is great – though gold would have been better! 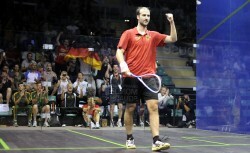 Sixth seeds Germany beat South Africa 2/0 to win the play-off for fifth place – recording their highest ever finish. 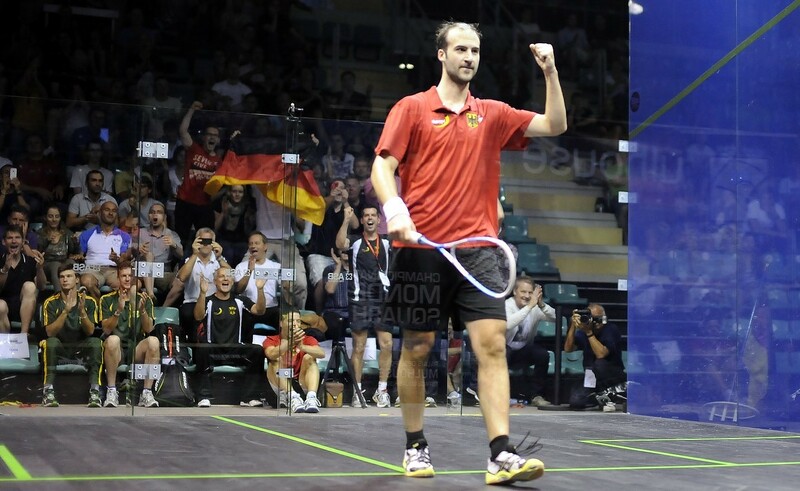 “It was a fantastic performance by my team,” said German team manager Oliver Pettke. “It’s unbelievable to be fifth in the world – I am so proud of my team. 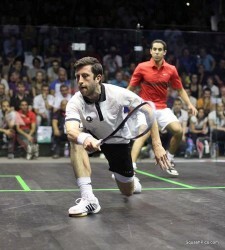 “We had a lot of German support here which was great – and I am sure our success will give squash a big push back home. India also celebrated their best finish since 1979, bettering their seeding by beating Malaysia 2/0 in the play-off for seventh place. 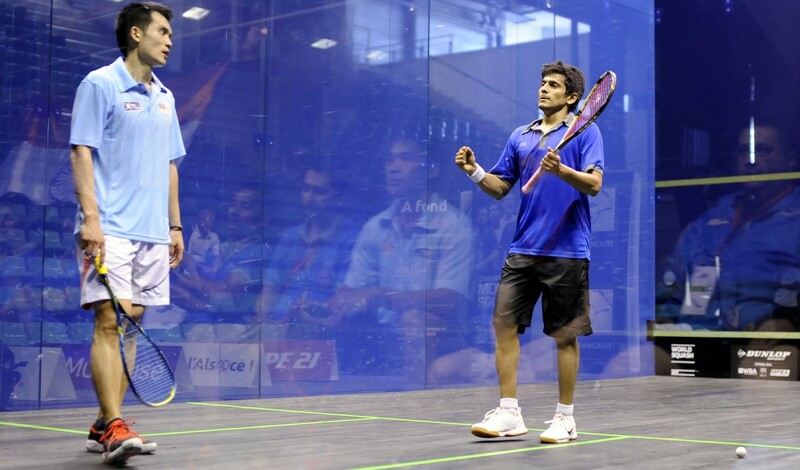 Mahesh Mangaonkar beat Muhd Asyraf Azan 14-12, 11-4, 11-7 before Indian number one Saurav Ghosal recovered from two games down to defeat seasoned opponent Ong Beng Hee 6-11, 7-11, 12-10, 11-7, 11-9. 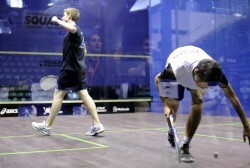 Ghosal added: “It’s been a tough week, but I think we all played well and are pleased to finish today with a win. We were disappointed to lose yesterday to Germany – who have finished fifth today – I was so close to beating Simon (Rosner) in five. But arguably the most notable success was achieved by Scotland, the 16th seeds who won the play-off for 9th place after beating Pakistan 2/1.